For many people around the world, the Amazon is a mysterious faraway land of impenetrable jungles, majestic rivers and indigenous peoples. But what many of us may not realize is that we all have a connection to the Amazon—through the air we breathe, the water that irrigates the food we eat, the natural ingredients in the medicines we use, or the shifting weather patterns that we experience around the globe. 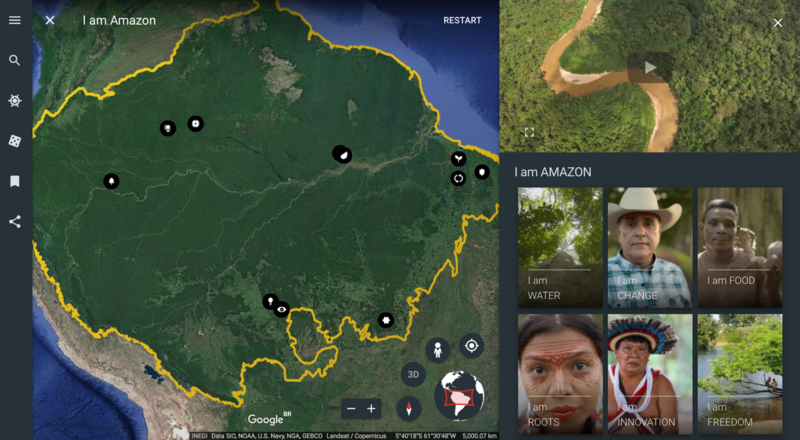 Today we invite you to venture into the heart of the Amazon and discover your connection to the world’s largest rainforest through Voyager, Google Earth‘s storytelling platform. You’ll find 11 new interactive stories about different parts of the vast Brazilian Amazon region, which is home to about 27 million people and a wide array of cultures. All of these stories are told by the diverse peoples who call the forest home, and some were produced by one of Brazil’s greatest storytellers, the acclaimed film director Fernando Meirelles. Combined, they create an immersive web and mobile experience told through video, mapping, audio and 360° virtual reality, covering a broad range of issues facing the future of the rainforest—and, consequently, the planet. These stories reflect the complexity of the Amazon, which produces 20 percent of the Earth’s oxygen and is home to one in 10 of the world’s animal species. Learn about the supply chain behind the vast array of forest delicacies, like Brazil nuts and açaí, that end up on supermarket shelves worldwide; or about local economies once dependent on illegal logging that are now reorganized around sustainability efforts; or about Quilombolas, communities of descendants of enslaved peoples, and their struggle to obtain titles for their lands. Thanks to our partnership with the Instituto Socioambiental, we’re also publishing in Google Earth Voyager for the first time a comprehensive atlas of indigenous lands in Brazil and the people who live there. And we’re filling in those maps with in-depth interactive stories told by the Amazon communities themselves. You can learn about indigenous peoples like the Tembé and the Paiter Suruí, who are using monitoring technologies to protect their territories from illegal incursions by outsiders and deforestation; or the Yawanawá, a tribe that under the leadership of women has revived its cultural heritage and carved out a place in the global cosmetics industry by sustainably harvesting urucum, a reddish seed used in lipstick and other products. These stories are the culmination of 10 years of work with the peoples of the Amazon. Back in 2007, Paiter Suruí leader Chief Almir came across Google Earth and quickly saw its potential to help safeguard the heritage and traditions of his people. So he proposed a partnership with Google that resulted in an online map of Suruí cultural heritage, the first ever indigenous community-led deforestation and forest carbon mapping project. Through this project, the Suruí calculated the value of their forest on the voluntary carbon marketplace, and became the first indigenous community to receive funds for preserving their lands. Technology is an important tool that is helping us to protect the forest and keep our traditions alive. Over the years, we’ve built on this work with the Suruí and expanded it to an additional 30 communities in the Amazon, with more to come. We also recently integrated certified Brazilian indigenous territories into Google Maps, all 472 of them. Since its creation more than a decade ago, Google Earth has always aimed to bring the magic of our planet to everyone in a beautiful, accessible and enriching way. We hope these fascinating stories from the Amazon do all of that and more, inspiring curious minds to explore, learn and care about our vast, fragile planet.